Seven out of ten people over the age of 65 will experience an unfortunate health event. In the case of serious injury, terminal illness, or other debilitating medical condition, your focus should be dedicated to healing and recovery instead of worrying about spending all the assets you have worked so hard to set aside for retirement. In this episode of Money Script Monday, Adam presents 2 strategies to protect yourself from the immense costs of an unfortunate health event. Hello, and welcome to another episode of Money Script Monday. My name is Adam Reyna and I want to thank you for attending. Today's topic is, How to Secure your Retirement Assets from an Unfortunate Health Event. Before we get started, I just want to say how excited I am about this topic because it is a very important topic and it's one that's oftentimes overlooked when we're planning in retirement. Some of the biggest risks in retirement that we usually hear about are stock market volatility, increasing taxes, outliving your money. Well, if you don't plan for an unfortunate health event, this could impact your retirement more than any of those combined. Let me start with some numbers for you. Believe it or not, the baby boomer generation is a huge generation, there's no surprise there, that's approaching retirement or a lot already in retirement. There are a number of the 10,000 baby boomers that are retiring every single day for about the next 19 years. It's a huge wave of retirees that are approaching the age 65, or even some sooner, some a little bit past, but there's a lot of people there that need help planning. Another very shocking stat is that the average 401(k) of a baby boomer that's 65 or older, is actually only $58,000. So, a lot of them, that's their only retirement assets. 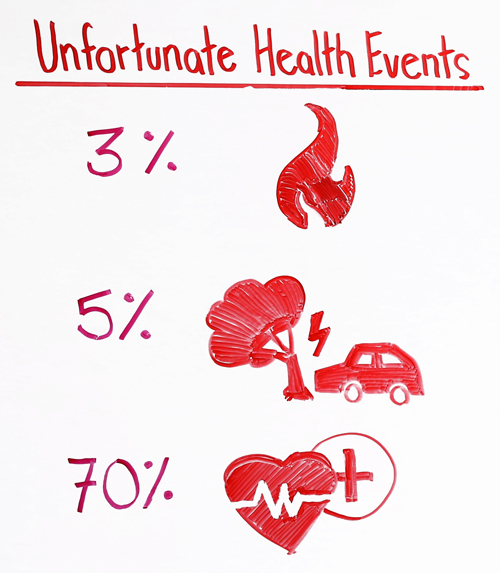 Let's talk about the unfortunate health event and how much that could potentially cost. I looked it up before I started this presentation, and the average cost today is about $90,000 for a year's worth of nursing home coverage. That's somebody that may have Alzheimer's or someone that needs 24-hour care or 12 hours a day care. It's going to be about $90,000 a year to cover that unfortunate health event. So, back to that number of the 58,000, the average 401(k), what happens if that's that person's only source of funds, if it's their only assets? Not only are they going to have to spend down those assets and no longer have it available for income and living expenses, but it might impact their family. Their adult children may have to help pay for it. They may have to get some sort of help from some sort of source. That's why we're talking about this topic today, because we want to protect your retirement assets from an unfortunate health event. Let's take a look at some numbers here before we get into some of the differences of how we cover those unfortunate health events. 3%. I'm sure everybody that's watching this that owns a home has insurance. Well, did you know that there's only about a 3% chance that you'll use that home insurance? But we plan for it because of the just in case. Did you know that even if you're the best driver in the country, you've never been in an accident, you've never sped in your entire life, that there's only about a 5% chance that you'll ever use your car insurance? Look at this number, much bigger, 70%. What that number is, is that there's about a 70% chance if you're over the age of 65, you will have an unfortunate health event. That could be anything from a heart attack, a stroke, Alzheimer's. 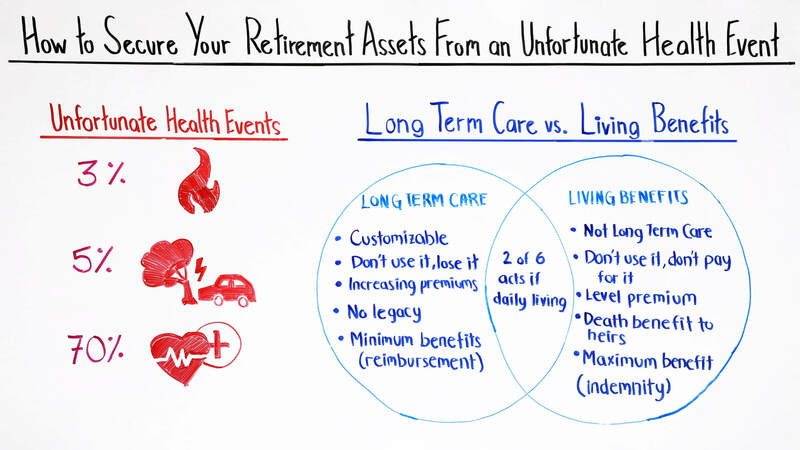 There are a lot of different things that would qualify as an unfortunate health event, but essentially, it's something that may have a hospital stay or ongoing care that could affect your retirement assets. Those are some shocking stats, but the good news is, we have a solution for you here. There's really two ways to cover for these unfortunate health events. One of them is very common that you probably have heard of, and that's getting Long Term Care insurance, LTC. When referring to Long Term Care insurance, we're talking about a standalone policy. That is just insurance that's only going to cover a Long Term Care claim. It's a great way to cover it, LTC, and I would recommend, if that's something that you're interested in, you do that 100%, because really, as long as you're planning for it, that's the most important thing. 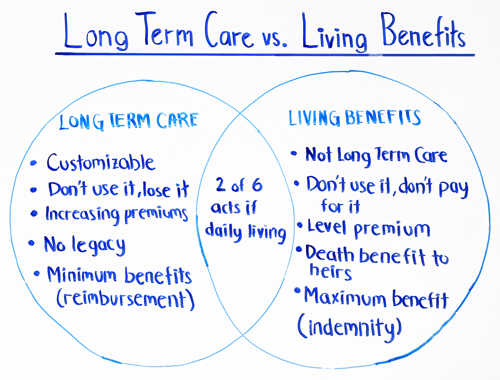 Let's talk about some of the differences between a Long Term Care policy, and what we'll talk about in a second, living benefits. Long Term Care is great, because it's fully customizable. It's really the best way, the most bang for your buck to cover for those long term care expenses, and again, very customizable. If you want to plan on a certain amount per month for 36 months or 24 months, you're able to customize it quite a bit. One unfortunate thing, though, is if you never use your Long Term Care insurance, there's no benefit there. If you go 10 years paying, let's call it $300 a month and you never go on claim and then maybe pass away or lapse that policy, unfortunately, it's gone and that turns into just an expense at that point. There is an opportunity for those premiums to increase which is a little bit of a hesitancy when people are considering Long Term Care. Unfortunately, like we said, if you never use it, you never go on claim, there's nothing there for you. Then if you were to pass away after paying on this policy, let's say for 10 years, unfortunately, your beneficiary doesn't get anything either. Finally, the Long Term Care insurance typically pays a minimum benefit. What that means is, you usually go on a 90-day elimination period. So, you're covering these Long Term Care costs, whether it's in-home care, or nursing home care. Then what the Long Term Care insurance policy is going to do is they're going to reimburse you for exactly the amount of money that you had to use for that Long Term Care. If you have questions on this, I would highly recommend talking to your trusted advisor. Someone that is licensed and trained in Long Term Care insurance because again, it is a good thing, but you have to look at it from both sides. You notice here the overlap is the way that you qualify for Long Term Care insurance is typically when you cannot perform two of the six acts of daily living. That's actually the same qualification factors for living benefits. When we say living benefits, believe it or not, this is tacked on to a life insurance policy. If you've never heard of them, again, I recommend talking to your insurance agent or some sort of trusted advisor on how these work. It is a fairly new feature on a life insurance policy that just about every insurance company is now putting on their policies because we know how big of a risk an unfortunate health event could be. Let's talk about how you qualify. First off, a living benefit on a life insurance policy is not Long Term Care. We cannot call it that because it is not Long Term Care. What it is, is actually an acceleration of your death benefit. Your death benefit's there in the event that you pass away, your beneficiaries get all of that tax free death benefit. Believe it or not, you have an unfortunate qualifying health event when you cannot perform two of the six acts of daily living, you can use a portion of your death benefit for yourself while you're still alive to cover these costs of the unfortunate health event. One good thing, you don't have to pay for it up front. It's part of your life insurance premium, and those premiums are going to stay level. If you're paying $200 a month, you're not going to see an extra $200 a month for Long Term Care. It's all bundled into one premium that will stay level. If you never use it, you never pay for the living benefits like you would in Long Term Care insurance. Another great thing here is that it does have a death benefit tacked onto it. If you go those 10 years, never go on a claim for your living benefits, like we said, with the Long Term Care, you'd get nothing. If you go 10 years and you pass away, your beneficiaries actually get the entire death benefit. $250,000 tax-free or whatever amount that is, whatever you're comfortable paying, there's a death benefit involved. Then let's talk about actually when you do go on claim and you have an unfortunate health event, how do you go ahead and access that money? Well, you prove to the insurance company that you cannot perform two of the six acts of daily living. Or, if you had a critical illness like a stroke or heart attack, any of those qualifying events, what the insurance company is going to say is, yep, that's a qualifying event, and you qualify for up to this much per month. It's based on a monthly acceleration of that benefit. Or if you need a larger lump sum, they'll also work with you on that. Again, work with your trusted advisor because there's a lot of literature on these and they're very customizable as well. It's all fairly cut and dry, but it does take a lot of explaining. So, we want to make sure that you understand it fully before moving forward. One great thing here, I call it a maximum benefit, this is indemnity. As opposed to reimbursement of only the hard costs of your long term care, if you qualify and you can get $200,000, the insurance company will write that check and give you $200,000. The great part is you do not have to use it for long term care coverage of nursing homes, putting a ramp on your home, buying a wheelchair. They actually call it quality of life expenses, as well. If you want to take that dream vacation to Italy, buy a Ferrari and drive around for your last 18 months, sounds good. Of course, that would require an unfortunate health event in order to get that. The key there is they'll give you your maximum benefit no matter what, and you can use it for whatever you'd like. Again, it's a very complicated subject here. And I'm glad you listened to this video. Please work with your trusted advisor because remember, there is about a 70% chance that you will have an unfortunate health event. We want to protect those retirement assets so you can use those to enjoy your retirement and not have to spend them down for an unfortunate health event. Thank you for attending. Again, my name is Adam Reyna. Adam Reyna is a Field Support Representative at LifePro. 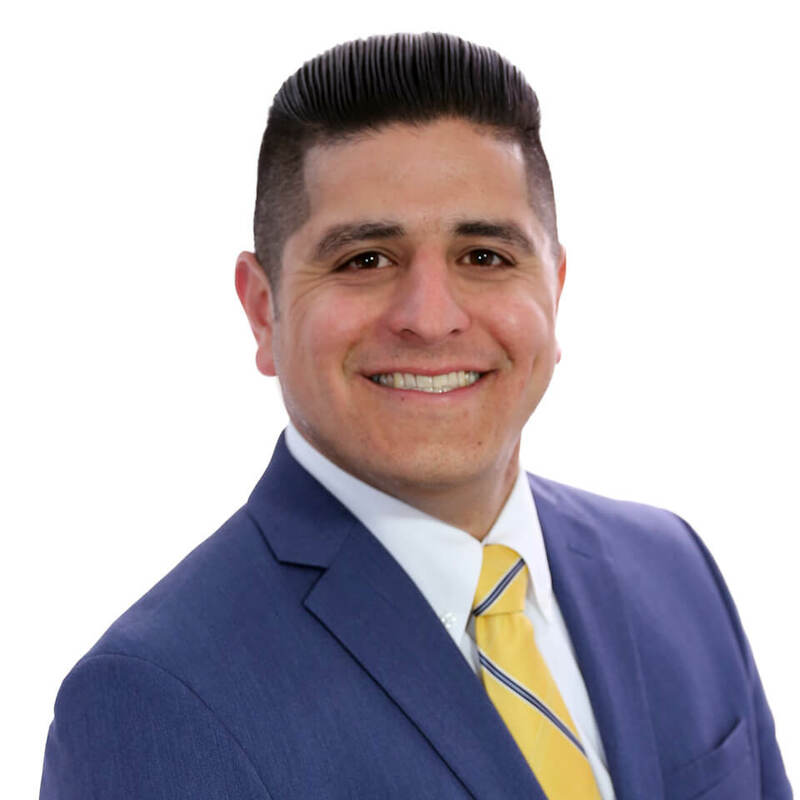 He coaches hundreds of financial professionals on how to build effective financial strategies that achieve their clients' long term goals and helps them stay educated on the latest industry trends.